Published in September 2017, this book is based upon Peter Henderson's definitive Identification Guide to the Inshore Fish of the British Isles (Pisces, 2015). It is a collaboration between Kees Camphuysen of the Royal Netherlands Institute of Sea Research (NIOZ) and Peter Henderson of Pisces, and adds a huge amount of information on the remains of fish, such as otoliths and vertebrae. 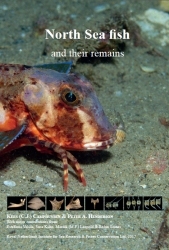 It is regarded as the most accessible work on fish remains, and is therefore invaluable to bioarchaeologists, ornithologists, and anyone else for whom fish remains provide insight into their work. It also serves, of course, as a more generalised fish identification guide for marine biologists, professional and amateur ecologists, and students. For more information and updates on the book, visit the North Sea Fish website.